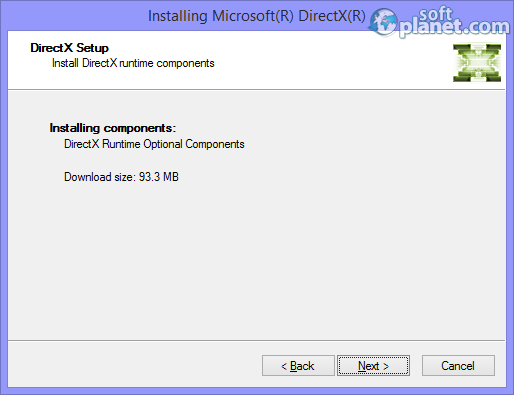 SoftPlanet makes it possible for everyone to get free DirectX 11 download directly from our servers. There is no registration needed for downloading. DirectX is an essential collection of applications for handling tasks related to multimedia and game performance. Originally its name was Direct3D and later it was changed to DirectX. Its components also carry a part of the program name and consist of Direct3D, DirectDraw, DirectMusic, DirectPlay, DirectSound and so forth. Direct3D helps make three-dimensional animation possible, DirectDraw helps produce two-dimensional visual effects, DirectSound boosts the performance of audio effects on your PC, etc. If you ask yourself: "Do I need DirectX?" – the answer is Yes, you do. The supported operating systems include Windows XP, 2003, Vista, 7 and 8. It also runs on 32-bit and 64-bit versions of MS Windows. The installer will automatically find and set the latest supported version for your OS plus all the missing files if you have any from any previously installed version. 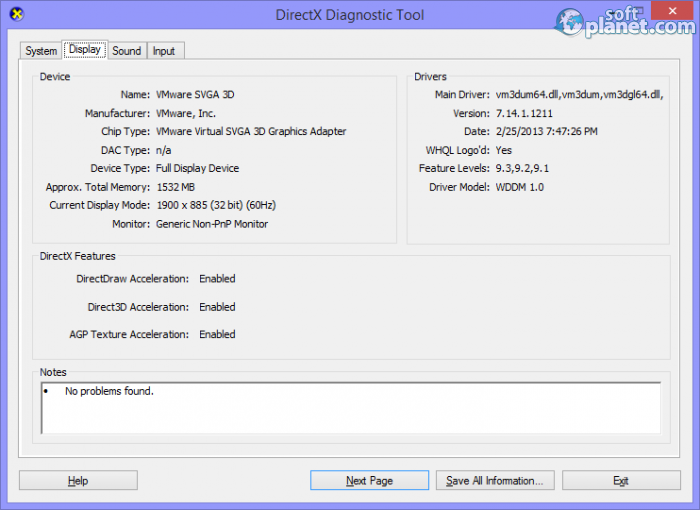 This tool is backwards compatible like most Microsoft products which means that even older versions like DirectX 9 or DirectX 10 are supported by Windows 8. This is one of the ways to open the user interface of DirectX: Find the Run field in your Start menu and type dxdiag in there and this is it. Then you will be asked if you want your drivers to be checked if they have already been digitally signed. 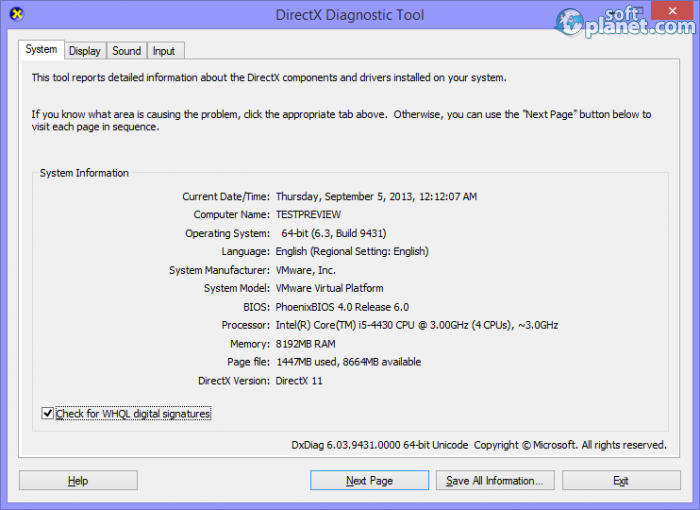 After that you will see the DirectX Diagnostic Tool screen. All the tabs for all the components and drivers which you have installed are placed on top. Clicking on every one of them will open that particular tab and will show you the detailed information related to it. The first one, called System, shows brief information about your computer current date, time, OS, BIOS, etc. 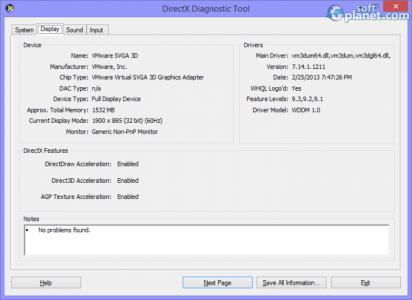 There is nothing indeed that you can perform with the DirectX Diagnostic Tool except to see all the details about all the components and are they cause any problems. The latest installed version is also shown to let you know if you have to update it if a newer one is released. DirectX gives smoother gaming experience. It helps your multimedia files and especially games to run with their full power and without restrictions. This package of drivers and libraries is what you need to have on your computer in order to achieve an optimal level of your media and game performance. Our security scan shows that DirectX 11 is clean from viruses. The current version of DirectX 11 has been scanned by our system, which contains 46 different anti-virus algorithms. That ensures that DirectX 11 is 100% safe for your computer.